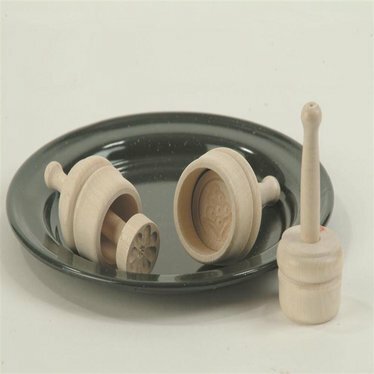 Finely carved mold interior with smoothly sanded exterior sets these German-made butter molds far above any other we've found. To use butter mold, soak in cold water for 30 min., then add butter and chill. Comes with plunger to push butter out. Assorted patterns, each one unique! Note: To prevent molds from cracking, coat mold with food-safe mineral oil after every use. Small: Holds about 1/3 oz (10 g). 1-1/16"OD x 1/2"H.
Medium: Holds about 3/4 oz (20 g). 1-1/4"OD x 13/16"H.
Large: Holds about 1 oz (30 g). 1-7/16"OD x 3/4"H.
Dimensions given are size of butter after being removed from mold. Don't purchase this item if you need it soon. I ordered in March and still have not received the item. They said the end of April was the estimated time of arrival, that turned to May and here we are in July with no luck. These are great. The butter is lovely, and they couldn't be easier to use.